George Graham Reviews Whiskeytown's "Pneumonia"
The history of rock music is littered with worthy bands who broke up before they had a chance to reach their potential, either musically or in terms of popularity. This week we have an excellent example, but with a bit of a twist. It's a post-breakup release that has been much anticipated by the group's fans. The band is Whiskeytown and their newly released CD is called Pneumonia. It turns out to be this fine roots-rock band's best record of their career, and not just some odds and ends put together by a record company anxious for some product. Whiskeytown was formed in North Carolina in the mid-1990s, and by the time of their 1997 release Strangers Almanac, produced by Jim Scott, the group had attracted a fair amount of critical attention for their combination of musical honesty and astute songwriting, not afraid to bring in an attractive pop melody. But the band's personnel was anything but stable. In 1997, three fifths of the group, including founding guitarist Phil Wandscher left. Lead vocalist Ryan Adams, who had wanted Whiskeytown to be a cooperative effort, by necessity took on an increasingly prominent role. Others came and went -- at least ten members joined and left -- and the group did a number of farewell appearances, though Adams, along with fiddle player Caitlin Cary and multi-instrumentalist Mike Daly re-grouped from time to time. In 1998 and 1999, they worked on sessions that would lead to Pneumonia, which as the project proceded, looked to be a kind of swan-song for the band. Meanwhile, for Adams, still in his mid 20s, his own life and career had been through similar changes, with love taking him to live in New York, followed by a move to Nashville when that relationship fell apart. Last year, he released his first solo album, Heartbreaker an emotionally dark, but artistically brilliant recording that ended up on many critics' Best of the Year list. Adams was joined by neo-traditionalist Gillian Welch and her partner David Rawlings, with guests including Emmylou Harris, who invited Adams to appear on a Gram Parsons tribute special on PBS. At the time of Heartbreaker, Adams made reference to Pneumonia in interviews, saying he wanted it to be "a brilliant last record" for Whiskeytown. It had already been in the can at the time, but held in limbo by the corporate machinations of record labels swallowed by merging media conglomerates. 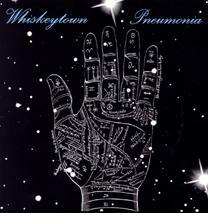 Now, though a small subsidiary of a big label, Whiskeytown's Pneumonia is finally out, after some tweaks and a new mix. In an interview last year Adams said that the band, or the fluid collection of people comprising Whiskeytown, recorded some 30 songs in three phases, some more experimental than others. There was an attempt to give the album more of a pop spin, but in the end, after engineer Scott Litt of R.E.M. fame had been brought in to mix the project, Adams and producer Ethan Johns went back to a more basic, intimate sound, that turns out to be one of this album's biggest strengths. That is not to say that the pop experiments don't work. The writing team of Adams and Mike Daly can some up with some appealing melodies, and they also show their affinity to Sixties Beatles-influenced pop. But the brooding folkie in Adams comes out as well. The arrangements run from almost solo to pieces with orchestral backing, and not just strings, but often a woodwind and brass ensemble. The result is a gem of an album that spans a lot of musical temperaments, but keeps its honesty and tastefulness, while including a lot of very good writing. Besides Adams, Daly, Ms. Cary, and drummer-producer Ethan Johns, others appearing include bassist Jennifer Condos from Joe Henry's band and Smashing Pumpkins guitarist James Iha, who tends toward roots rock on his own projects when he is not making grunge with the Pumpkins. Also appearing on guitars are Brad Rice and Tommy Stinson with Richard Causon on keyboards. Pneumonia, Whiskeytown's newly released, supposedly final album, recorded between two and three years ago, is by far the group's best work. In a way, it breaks new ground for a roots rock band, where adhering to the basics of folk, country and early rock influences comprise the credo. This album is much more freewheeling, with its downright interesting experimentations with the orchestral arrangements, a mix of other ingredients including psychedelic pop, and occasional lyrical departures from the standard fare, making this a significant album, and an ironic one, considering how this amorphous group had hit its peak before they went their separate ways. Though Ryan Adams, by his lead vocals, does tend to dominate the sound of the record, it was Mike Daly who co-wrote almost all the material with Adams, so he was a major part of this swan-song effort. It's also interesting hearing this CD after Adams solo album, released last year, but recorded a year after this one. One can hear where his music was heading. Our sound quality grade for Pneumonia is definitely an "A." I heard a little bit of distortion on Adams voice in one spot, but otherwise, the recording is very clean, and the dynamic range is refreshingly wide, a rarity in these days of all-loud-all-the-time pop CDs, especially coming out on a subsidiary of a major label. Ethan Johns' new mix for the CD was first-rate, and it was preserved by mastering engineer Doug Sax. Whiskeytown made its mark, intermittently, in the 1990s as one of the bright lights of the roots rock scene. In the best show-business tradition, they made their exit at the very peak of their form. One can only hope that maybe they will decide to get together again after all. One can never tell with this band.